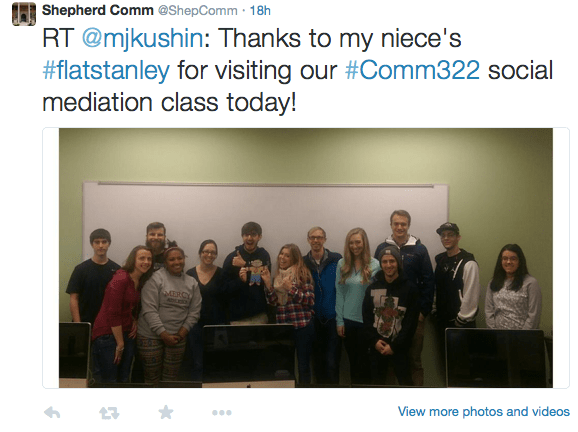 In the last few posts, I’ve been writing about my Social Media class and the semester project we’ve been doing. To recap, students create a social media content strategy for our department’s social media (the details of the assignment are on the previous post). They then use this plan to create content for the department. They create content 3 times, each time they are creating content for a certain time period. The content is presented to the class and then goes through an editorial process (i.e.., I grade them and make any needed mods) if needed before being published. With the semester winding down, I want to share some of the work the students have been doing! Students have done a great job across the semester and have worked hard to try to create content that will resonate with students while also targeting our goals and conveying our key messages. Running an account for a small university department is a unique challenge. Although as professors we are exhilarated by what we teach and have a love and passion for school, it is a bit tougher to get students excited about, well, that part of the college experience responsible for all the work they have to do. 🙂 Believe it or not, school is the last thing some students want to be thinking about when they aren’t in class. 🙂 And I think having to try to overcome the challenge of promoting school is a great experience for students. I’m very pleased with how the students have done in the face of these challenges. The semester began with very little content on our accounts, and few followers. Students have done a particularly strong job working between groups to create content that works across platforms. For example, you’ll see how some of our blog posts tie into our Instagram and Twitter in regard to profiles of students and faculty. Twitter – Prior to the class starting, we had a Twitter account but it was rarely posted to. Now, we have a variety of content from the informative to reminders of important dates to community-building memes and humorous posts students in our department can relate to. Blog – The blog is brand new and our department hasn’t done much to publicize it yet. But students have done a great job getting it going. We’ve had highlights of students and insights into classes and events students are apart of. Note: Part of the reason it hasn’t been publicized, is the university is in a tradition stage with its website. And we are waiting to see how that will impact our online presence. Instagram – Similar to Twitter, Instagram was something we had set up. But hadn’t done much with before the semester. Our Instagram team began creating videos to highlight professors and students (we’ve had a few sound issues, but are working them out). These videos are accompanied by photos of the individual “behind the scenes.” There are also other photos of other events. Students have one more round of content they will be turning in this week. And that content will be scheduled to carry us through the winter break. Altogether, I’m very pleased with how students have worked to help humanize our department and enable current students to connect with one another and perspective students to get a look at who we are and what we do. I feel we are moving in the right direction. In the last few days, interest in our content has really taken off as students have reached out and begun highlighting the work their fellow students are doing. I am excited to see how the department’s social media grows and advances in time. Is this a project I would do again? Absolutely. Students really bought into this project and worked hard to see it through. They expressed to me that they learned a lot from the class and doing this project. And, they said they enjoyed the opportunity to get hands-on experience. It was a very fun semester! I had a great bunch of students and I am very proud of all of them! I plan to continue with this assignment next year. I’m not teaching Social Media next semester. So where will the department’s social media content for Spring 2014 come from? I’m not entirely sure yet. But I’ve got some ideas in the works and a strong foundation to build upon! Thoughts? Questions? Recommendations for this project? Would love your comments and feedback below or send me a Tweet.